Hi Tone Clear Wax is an extract derived from concentrated marijuana oils. Hi Tone products are of high quality, and 100% safe to use. 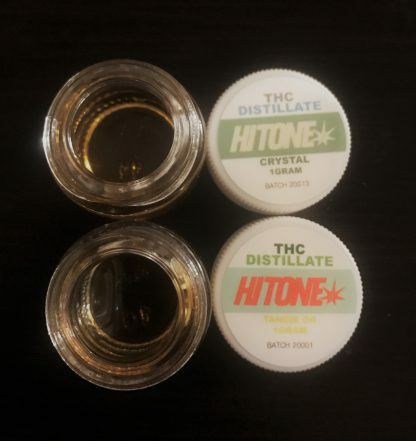 This 91% THC distillate Fractionally Distilled Marijuana Wax from Hi Tone is as pure-as-can-be. This Sativa wax is highly potent and versatile. It can be used topically and in a vaporizer. It is perfect for marijuana users that need energy and positivity to get through daily affairs. Hi Tone’s Sativa Wax Concentrate provides an intense high. It will make you feel energized, sociable, creative, focused, and simply euphoric. Hi Tone Sativa Wax is ideal for daytime consumption or when a social, physical, or intellectually engaging activity is going on. Its high THC composition makes it an extremely powerful product. Hi Tone Marijuana Wax Concentrates is fractionally distilled. Fractional distillation is a highly technical refinement process that takes away all impurities and extraneous plant materials to achieve super concentrated high purity medical-grade THC. Hybrid 1 gram; Indica 1 gram.